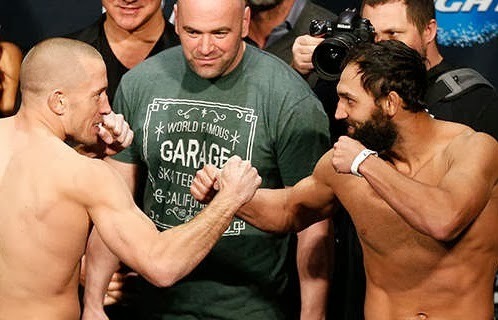 The Georges St Pierre vs Johny Hendricks Fight is the main event of UFC 167 for the Welterweight Championship. St. Pierre vs Hendricks video replay highlights is brought to you by PinoyThinking. This is the mixed martial arts event held on November 16, 2013, at the MGM Grand Garden Arena in Las Vegas, Nevada, U.S.A. We can also see in action with Rashad Evans vs Chael Sonnen fight. If you could see the video replay highlights of the UFC 167 and all its undercards, it's so entertaining to watch the fight. In this fight, Rashad Evans defeated Chael Sonnen via impressive round 1 KO. Will Evans get the title shot for the lightheavyweight championship with Jon Jones? Meanwhile, the fight between St. Pierre vs Hendricks went to Split Decision in favor to St. Pierre but the crowd and the majority of the MMA fans thought that St. Pierre will be dethroned and be Hendricks the current UFC welterweight champion. If you could see the video replay of the fight, it seems round 1 to 3 where Hendricks dominated the fight and St. Pierre managed to pull out the scores in round 4 and the last round but the judges score cards have it split decision with 48-47 for St. Pierre but it was a close fight. And I don't think that Hendricks got robbed because fans would also think it's a draw, Hendricks clearly don't dominated the entire fight because the champ has the guts to back it up. In the interview, "I need to hang up my gloves for a little bit," he said in the Octagon to Joe Rogan. "A lot is going on in my life ... I have to go away for a little bit." Will GSP retire from this competitive bout of his career? What do you think? Where: MGM Grand Garden Arena in Las Vegas, Nevada, U.S.A.
Watch the St. Pierre vs Hendricks Video Replay Highlights. Watch the Evans vs Sonnen Video Replay Highlights. I hope you enjoy the videp replay highlights of UFC 167 main event and co-main event, St. Pierre vs Hendricks and Evans vs Sonnen, respectively. Until for the next installment.